So what is Fair Trade 2.0? For us, Fair Trade 2.0 is about sustainable, fair trading businesses that are the anchors for healthy industries, sound communities and resilient families - and responsible consumers. It is about trade with long term vision - and 'bottomlines' that reflect social and financial returns (a worthy challenge for a young conscience economist!). It is about sharing: 'paying it forward', paying back and earning 'sharing' credits - its about sharing more than money. It is also about the 'North' going 'South'... Fair Trade cannot, should not and never ought to have been just about the geographic 'South'. The terms "North" and "South" are semantic 'thorns' us, in Fair Trade have created for ourselves. Traditionally, it meant that producers and producer countries were in the 'South', and consumer countries were in the 'North' - but this is not true... So, when we say 'North', we really mean the consumer countries and when we say 'South' we mean the producer countries. This is about parts of Europe that find themselves under extreme economic pressure - national debt, low/no economic growth, huge influx of migrants, unemployment... (Greece, Italy, Spain, Portugal...) while parts of the geographic 'South' are flourishing. Paradoxically, Fair Trade should also not be about benefitting 'poor producers' at all costs either; it is about fair and non-exploitative practices, fair profits. Everyone deserves a Living Wage; no one needs a 'super-bonus' that's larger than the GDP of a small country... This is about a conversation that needs to happen - should anyone be classified 'worthy'? Who decides who is 'worthy'? 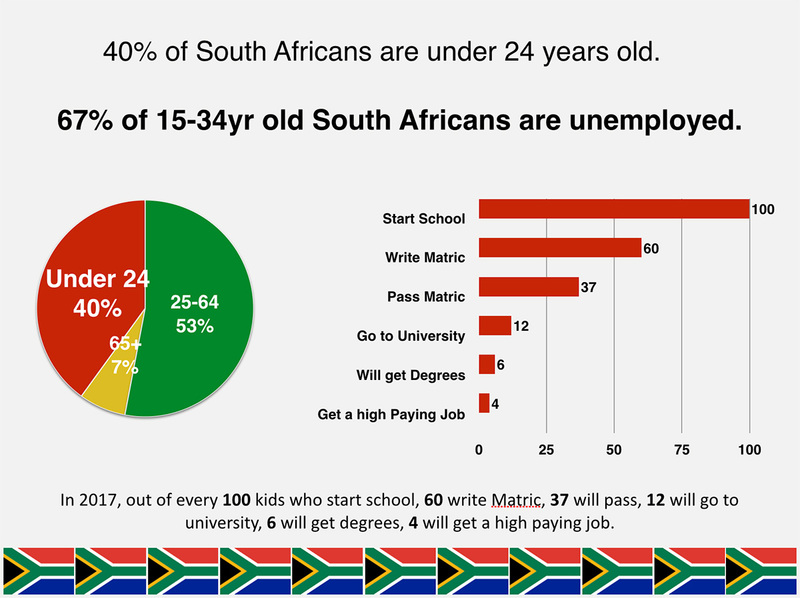 The sad reality is - no matter how much political 'spin' is added to the numbers - the picture is not improving - it is not improving in South Africa and its not improving in most of the developing countries of the world. 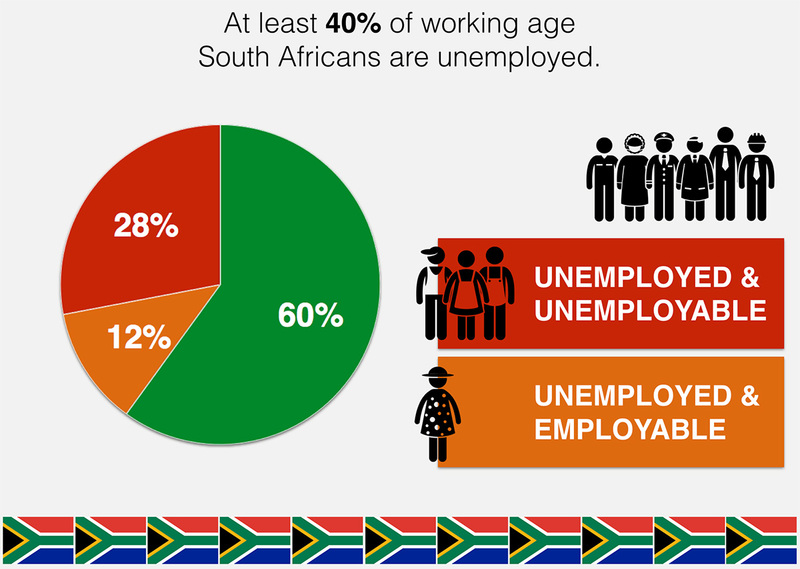 The prevailing economic models are broken... it is time to re-think how we think about wealth. One of the most basic things to encourage in the fair trading conversation is the value of exporting fully beneficiated products - shelf-ready products - products where the revenue from all the production inputs were earned where the products were made (this is the 'healthy industries' bit...). QUICK NOTE: this is a hypothetical product and the breakdown percentages, particularly in terms of the share of the various agencies in Europe, may be debatable, but the principles are sound; and on average, remarkably accurate). This breakdown assumes a grinder, containing 100% FLO black pepper (bought from a FLO certified farmer in India - 'south:south' trade = good! ), that is packed in South Africa and exported - fully finished (shelf ready) to Europe, where it enters a fairly conventional distribution channel that would include a fair trading wholesaler and a fair trade retailer (like a World Shop). In the case where the product is sold into a fair trading wholesaler who combines the importer/wholesaler function AND the product is sold into supermarkets, the percentages in the 'north' are slightly higher, but not enough to negate the principle. 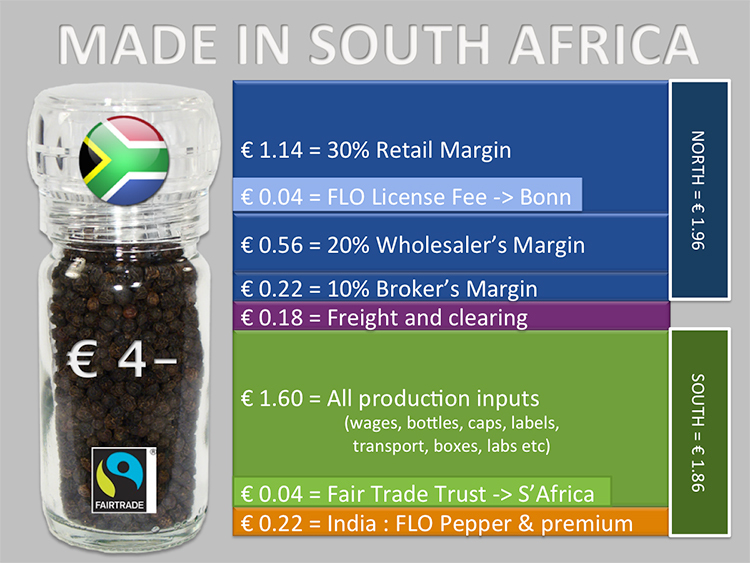 In this example, the earnings split between the 'north' and the 'south' are fairly equitable - roughly 50/50 and there is a double premium (benefit to the producers) : the FLO premium for the farmers in India and the contribution to the Fair Trade Trust for the producers in South Africa. This is a picture of healthy trade. 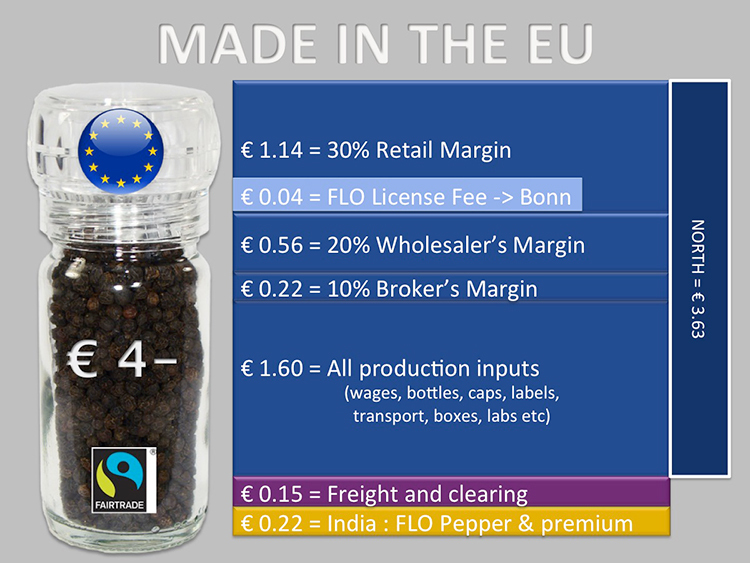 However, if the FLO pepper from India went directly to Europe, where it was processed, packed and sold, the picture is completely different: The only revenue that is earned in the producer country ('south') is the €0,22 out of the €4,00 sales price (5,5%). Sadly, this is the revenue reality for most products the consumers in Europe recognise as Fairtrade. The farmer's revenue on a Fairtrade banana (shelf-ready - 100% produced and packed in country of origin) is not even vaguely comparable to the Fairtrade story of coffee, or chocolate or jam where the Fairtrade ingredient is most often not 100% of the product and where the Fairtrade ingredients are significantly processed before being packed in Europe. Bottomline - some Fairtrade products are definitely more revenue friendly to the producers. Thankfully, vigilant consumers should be able to tell which products were imported 'shelf-ready', and which products were processed and packed in the EU. World Fair Trade Organisation (WFTO) guarantees that Turqle Trading is a Fair Trade Organisation. Turqle is certified by Fairtrade International as a Licencee and a Trader in Wine Grapes and Herbs and Spices. Fair For Life (IMO) has certified Turqle Trading as a handler of Fair Trade ingredients. Apart from the Fairtrade premiums that are paid to the pepper producers in India and the grape farmers in South Africa, Turqle pays 2,5% of the FOB price of every product sold, to the Fair Trade Trust. This money is used for the education of the workers and their children. Some of Turqle's customers also contribute to the Fair Trade Trust.